Have a strategy for the year and pick the quarter that you want each one achieved by. And then stick to it: book it, put it in your calendar and schedule time each day to prepare for it. Use the exam blueprint and the resources they call out as your preparation guide. Put them in a spreadsheet and track your progress. Where possible, use the same test center each time. The more familiar the environment, the less stress you will have. Every time I have used a new test center, there is always the additional effort to locate it and wondering what is the state of the test room?, etc. Give yourself two attempts to pass – this reduces the pressure and means you do not have to “know it all” to get a perfect score the first time. In my experience, trying to achieve the perfect score means you take too much time to prepare and will likely reschedule the test multiple times before you actually take the test; which gets in the way of velocity and making things happen quickly. Most test results have a blueprint breakdown as part of the feedback report when you do not pass, which tells you what areas you need to focus on for your second attempt. And remember, a “pass is a pass”; chasing perfect scores is not going to help you maintain your momentum. Each time you fail, keep track of which blueprint areas you did not pass; are they the same for each attempt or are they different? That analysis will indicate if you are possibly very weak in any blueprint areas. Any exam that gives you the option of pencil/paper or erasable board/marker, always accept it. Use that for taking notes, doing calculations and tracking which question types have appeared in the exam. This increases your success with the next step. As soon as you leave the test center, take detailed notes on the areas you struggled with; this will become the study guide for your second attempt. Mix the hard exams with a few simple ones during the year, this gives you some quick wins to keep your confidence up and maintain momentum. 1st cycle: answer the questions that you are completely sure of, mark the questions you are uncertain about. 2nd cycle: answer the questions you are fairly sure about and leave the ones you have no idea about as marked. 3rd cycle: answer the remaining questions with whatever your gut/intuition tells you. Open multiple UI windows to allow the multi-tasking of multiple questions at the same time. If the administrator tasks are very wordy – jump to the numbered tasks at the bottom to see what is actually required and then refer to the prelude text for supporting requirements and information. Many of the tasks can be quite convoluted and complicated, read carefully to make sure you understand exactly what is required before you start making changes. Some actions are very difficult to undo if you get them wrong. However, be careful of fast clicking in the Web Client UI, particularly when using the Virtual Machine Console (90 second freezes while the screen updates). Get used to “Click” or “Type” and wait a few seconds for the screen to refresh. If something goes wrong with the delivery of your exam, immediately notify the exam center proctor. Do not sit trying to troubleshoot the issue yourself. They will open a ticket and either get it resolved (make sure you ask for a time extension to compensate) or they will abandon the attempt and you will be entitled to a free resit. If you feel that you are not reaching critical mass with paper study, then consider subscribing for an instructor led course to help with up-skilling. If budget is an issue, use on-line learning resources like Pluralsight, etc. Also check if there are any books that you can buy. Also make sure you check out vendor conference sessions, vendor labs, podcasts, blogs, vendor documentation, whitepapers, reference architectures and best practice guides. It is all out there for the most popular certifications/technology areas. Most associate and professional exams in the market have question brain-dumps on sites like Testking, which obviously devalues those certifications. If you are planning on using them, use them at the end of your study period as a dry-run before you take the official test to validate your knowledge. My transcript follows the prerequisite exams required for each VCDX track I have achieved: DCV, NV and then CMA. VCAP-CID was cancelled in late 2014, so I never got the chance to resit it. In 2015, I focused on VCDX-NV instead. 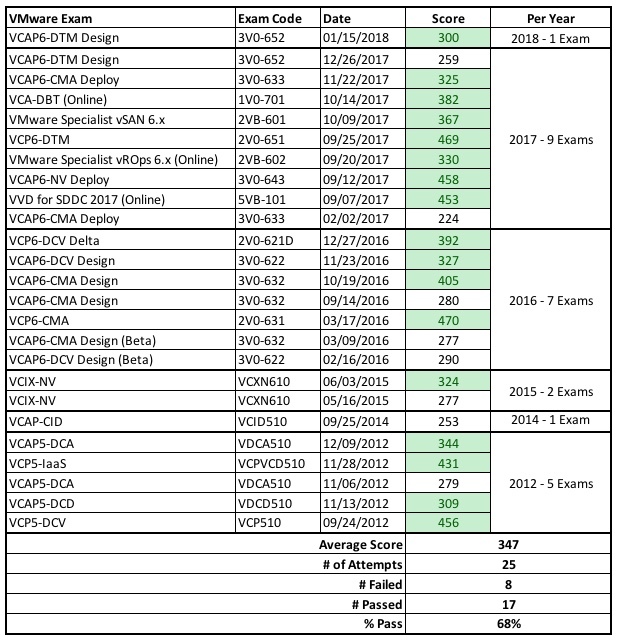 The VCAP6-CMA Design exam required 3 attempts, including the initial Beta exam. It was a poorly written test that did not represent the reality of vRA, so I had to spend a lot of time figuring out what the answers were. The long period for passing the VCAP6-CMA Deploy exam was problems with VMware delivery, where I had to book it 6 times and it took two attempts to pass. In late 2017, a series of VMware specialist exams were released, including the new VCA; so on a whim, I decided to knock them out. My current objective is to complete VCIX6-DTM and achieve the full set of VCIX6 for all tracks. In summary, being open to the pressure test of certification is not for everyone, however, if you have a passion for learning, it certainly is a rewarding way to achieve measurable goals. As long as you understand that “not passing” an exam is feedback for learning and if you embrace the process, it will be a fulfilling experience. One of the biggest kicks I had (aside from earning multi-VCDX and NPX), was when I finally passed the “VCAP6-CMA Deployment” exam late last year. It took me 11 months to get it and all of the false starts just increased my determination to get it done, even though I was tempted upon occasion to throw my hands up and say forget it.